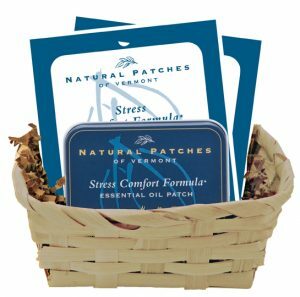 Gift Baskets | Natural Patches of Vermont, Inc.
We have assembled collections of our top-selling assortments and best-selling patches, and are presenting them in attractive bamboo gift baskets. 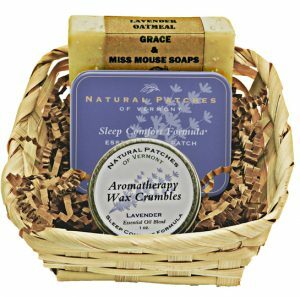 Offered in Two Styles, Our Aromatherapy Gift Baskets are Perfect for your Gift Giving Needs! 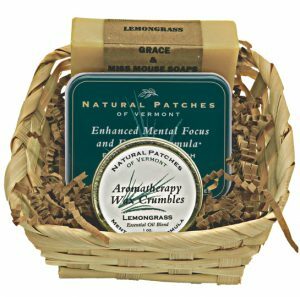 Aromatherapy Essentials Gift Baskets: Contains one each of the following: Natural Patches 10-patch Tin; Natural Patches Aromatherapy Wax Crumble, offering the same essential oil blend as the 10-Patch Tin, plus a Hand-crafted Artisanal Soap with a complimenting essential oil blend. All are presented in an attractive bamboo basket, wrapped in cello, and sealed with a decorative ribbon. 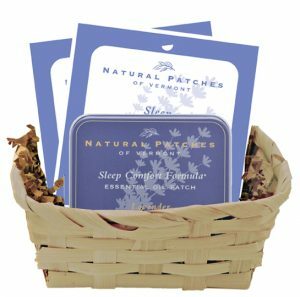 Best Sellers Gift Baskets: Each contains one Natural Patches 10-patch Tin and two 5-count tin-refill packs of the same essential oil blend. 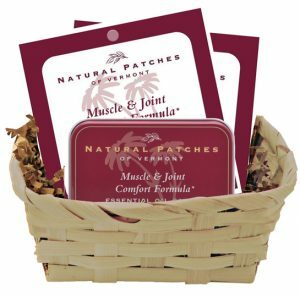 An enduring, combined gift of 20 Natural Patches! All presented in an attractive bamboo basket, wrapped in cello, and sealed with a decorative ribbon. 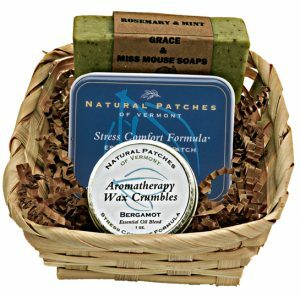 Offered at Special Discount Prices for a Limited Time, these gift baskets represent a great value!